Gato Class Submarine: Laid down, 5 January 1943, at the Electric Boat Co., Groton, CT.; Launched, 19 September 1943; Commissioned USS Gabilan (SS-252), 28 December 1943; Decommissioned, 23 February 1946, at New London, CT; Laid up in the Atlantic Reserve Fleet; Struck from the Naval Register on 1 June 1959; Final Dispostion, sold for scrapping, on 15 December 1959 to Ship Supply Co., Brooklyn, NY for $ 67,361.00. Removed on 11 January 1960. 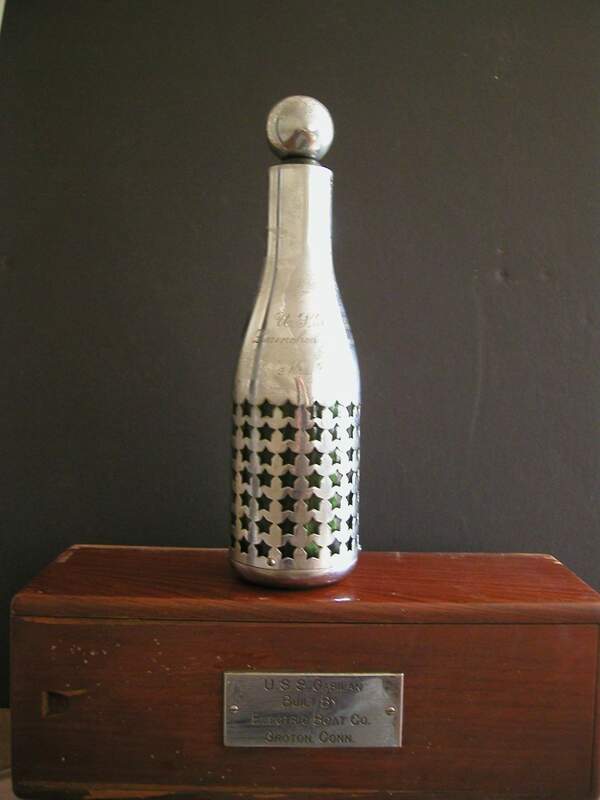 Gabilan received 4 battle stars for World War II service. Partial data submitted by Ron Reeves (of blessed memory) & Yves Hubert. Specifications: Displacement, Surfaced: 1,526 t., Submerged: 2,424 t.; Length 311' 9"; Beam 27' 3"; Draft 15' 3"; Speed, Surfaced 20.25 kts, Submerged 8.75 kts; Complement 6 Officers 54 Enlisted; Operating Depth, 300 ft; Submerged Endurance, 48 hrs at 2 kts; Patrol Endurance 75 days; Cruising Range, 11,000 miles surfaced at 10 kts; Armament, ten 21" torpedo tubes, six forward, four aft, 24 torpedoes, one 3"/50 deck gun, two .50 cal. machine guns, two .30 cal. machine guns; Propulsion, diesel electric reduction gear with four General Motors main generator engines, 5,400HP, Fuel Capacity, 97,140 gal., four General Electric main motors, 2,740HP, two 126-cell main storage batteries, twin screws. 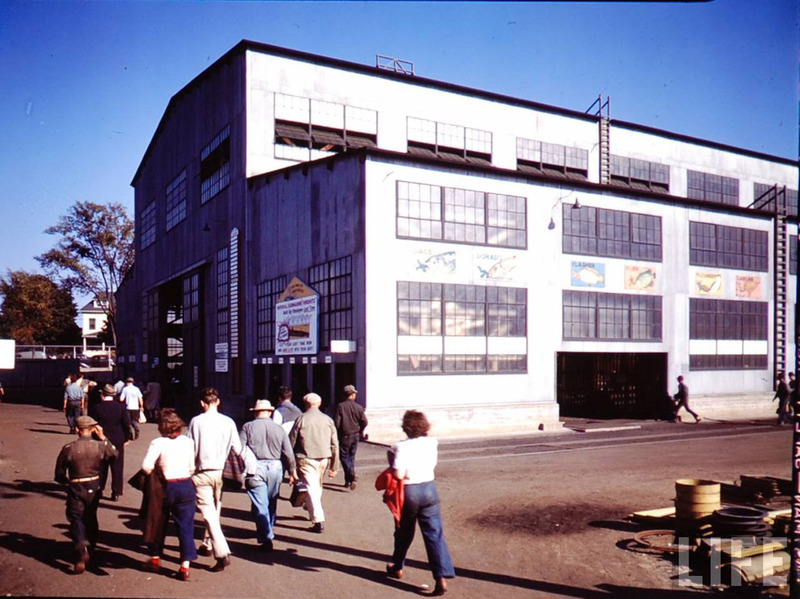 36k Commemorative post mark from Gabilan's (SS-252) keel laying 5 January 1943, at the Electric Boat Co., Groton, CT. Photo courtesy of Jack Treutle (of blessed memory). 315k Signs of the times: Logo's for the following boats are emblazoned on the building wall to the right: Dace (SS-247), Dorado (SS-248), Flasher (SS-249), Flier (SS-250), Flounder (SS-251) & Gabilan (SS-252). 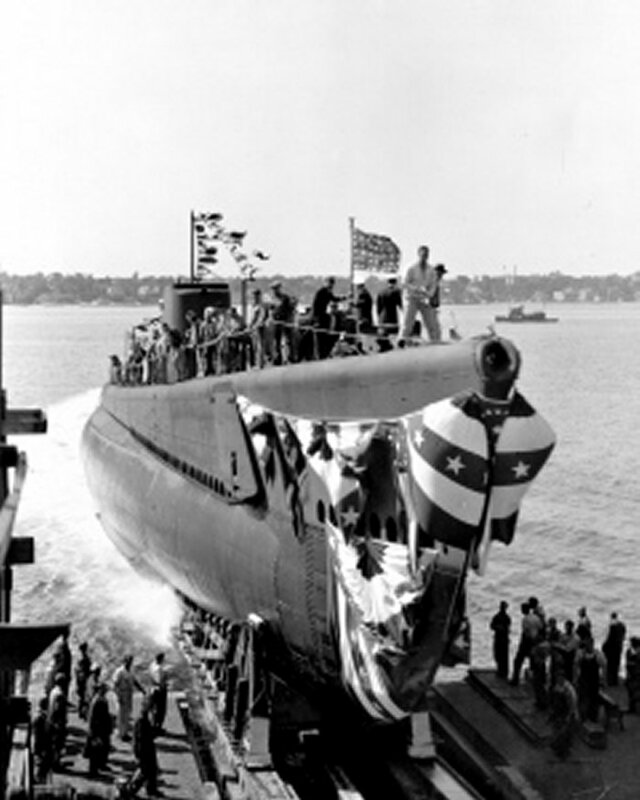 Photo from the Photo Essay How To Build A Submarine at Electric Boat Co. New London, Conn.
76k Gabilan (SS-252) slides down the launching ways, 19 September 1943. 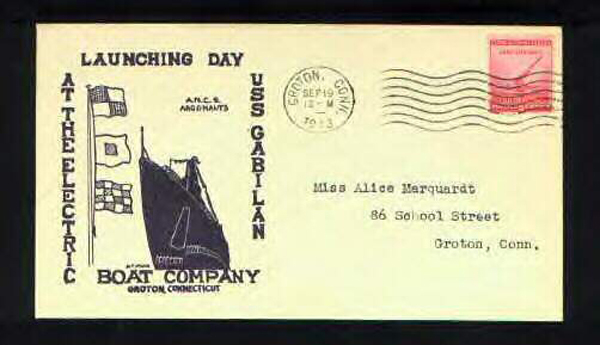 USN photo courtesy of Electric Boat Co.
654k Champagne bottle holder used by Mrs. Jules James, wife of Rear Admiral James, to christen Gabilan (SS-252) at the Electric Boat Co., Groton, CT., 19 September 1943. Photo courtesy of Robert Hall. 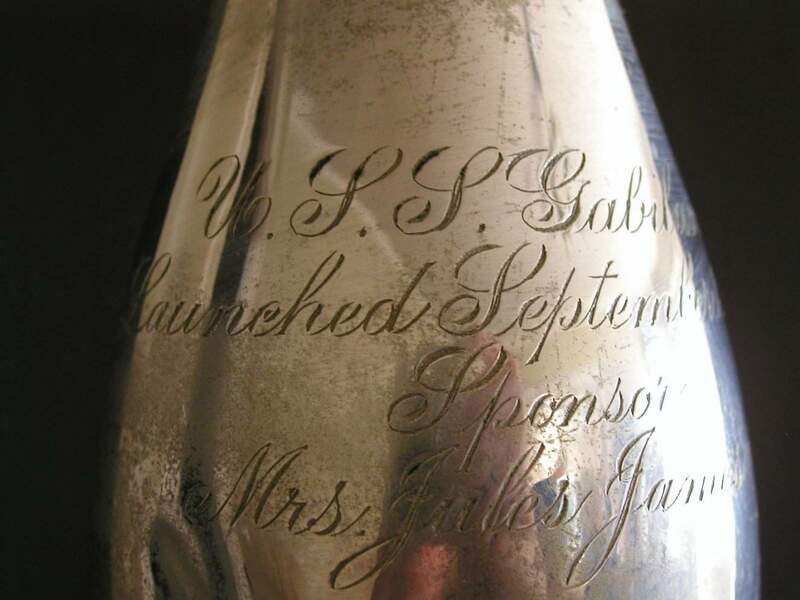 684k Close up view of champagne bottle holder used by Mrs. Jules James, wife of Rear Admiral James, to christen Gabilan (SS-252) at the Electric Boat Co., Groton, CT., 19 September 1943. Photo courtesy of Robert Hall. 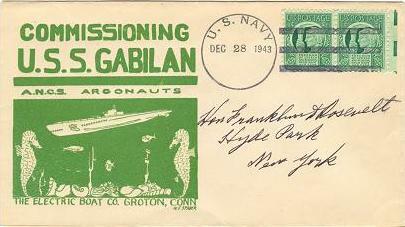 141k Commemorative post mark from Gabilan's (SS-252) launching on 19 September 1943. Photo courtesy of Scott Koen & ussnewyork.com. 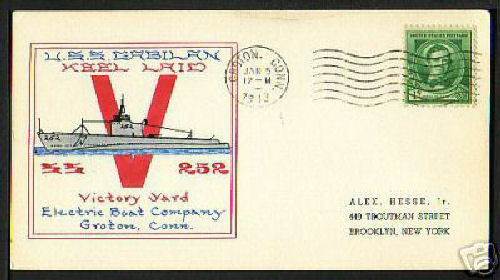 21k Commemorative post mark from Gabilan's (SS-252) commissioning, 28 December 1943. Photo courtesy of Jack Treutle (of blessed memory). 198k Gabilan (SS-252) torpedoes and sinks the Japanese minesweeper W-25 (492 tons) north-west of Zenizu, Japan in position 33^(o)51'N, 138^(o)35'E on 17 Jul 1944. Photo of W-19 Class Minesweeper by Takeshi Yuki scanned from "Color Paintings of Japanese Warships" courtesy of combinedfleet.com. 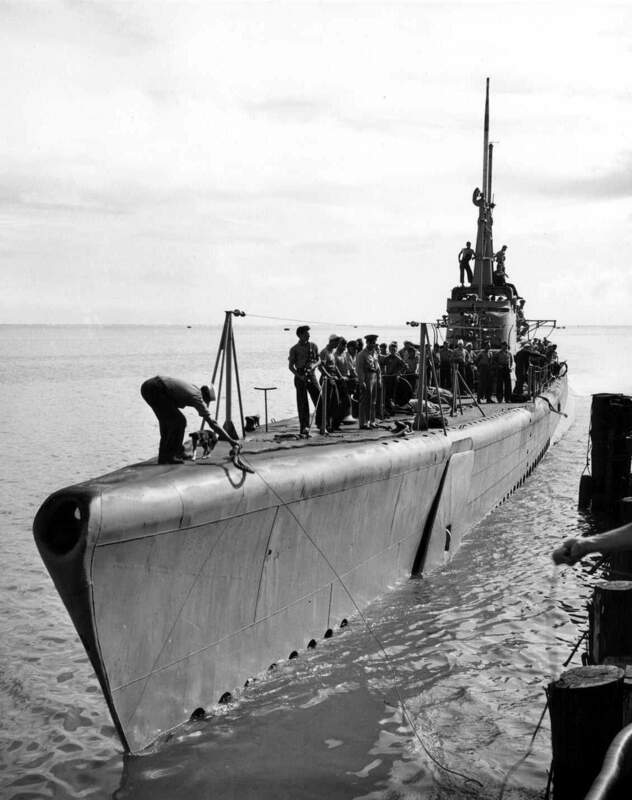 144k A sailor takes a line from the dock to secure the Gabilan's (SS-252) bow as the boat's crew prepare to come ashore, probably at Brisbane, Australia, 1944. Note the boat's mascot on the bow and the sailor holding a flag in his hand. 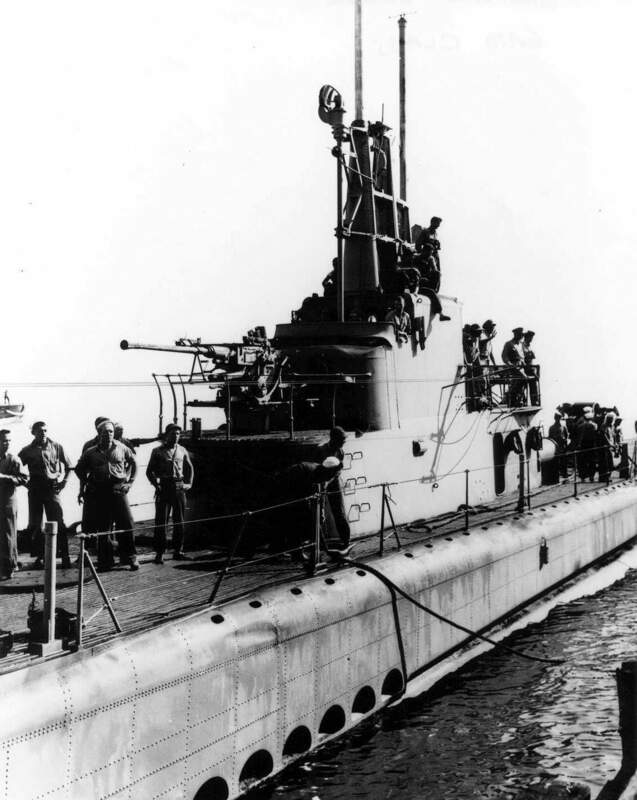 Victory and the end of the war meant the breaking up of most submarine crews. Garbo, Skeeter, Betty, and other dogs went home with crew members. Porches, lawns, and the occasional cat replaced steel hulls, tile decks, and depth charges. 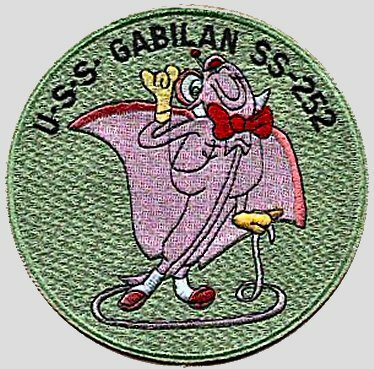 Gabby, mascot of the Gabilan, proudly represented all submarine sea dogs when he marched with his crew in a welcome-home victory parade in Mobile, Alabama, in October 1945. USN photo courtesy of ussubvetsofwwii.org. Pooch text courtesy of the article Sea Dogs by William Galvani in americanheritage.com. 168k Officers and crew of the Gabilan (SS-252), prepare to come ashore, probably at Brisbane, Australia, 1944. USN photo courtesy of ussubvetsofwwii.org. 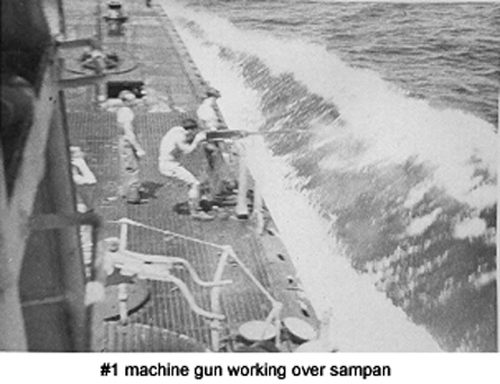 122k Gabilan's (SS-252) Number 1 Machine gun firing at an armed Sampan while on patrol. USN photo courtesy of nuckolsarchive.adamsonarts.com. 116k Gabilan's (SS-252) sixth and last war patrol (20 June-17 August 1945) was on lifeguard station for American fliers off Tokyo Bay. 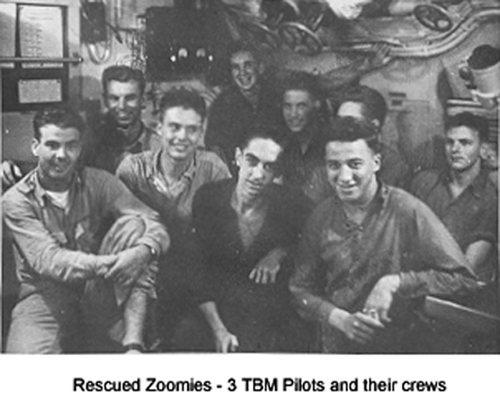 She first rescued six men, the crews of two torpedo bombers; then raced well inside Tokyo Bay, in easy range of shore batteries, to rescue another three-man crew. Six Navy "Hellcat" fighter planes gave her cover for the mission. On the way out, she paused to destroy a drifting mine with gunfire. Altogether, on this patrol GABILAN rescued 17 aviators. Text courtesy of DANFS. USN photo courtesy of nuckolsarchive.adamsonarts.com. 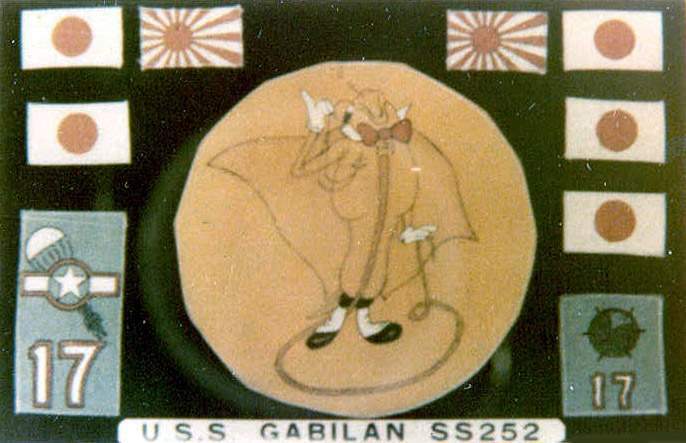 42k Battle-flag of the Gabilan (SS-252), 1945. USN photo courtesy of ussubvetsofwwii.org. 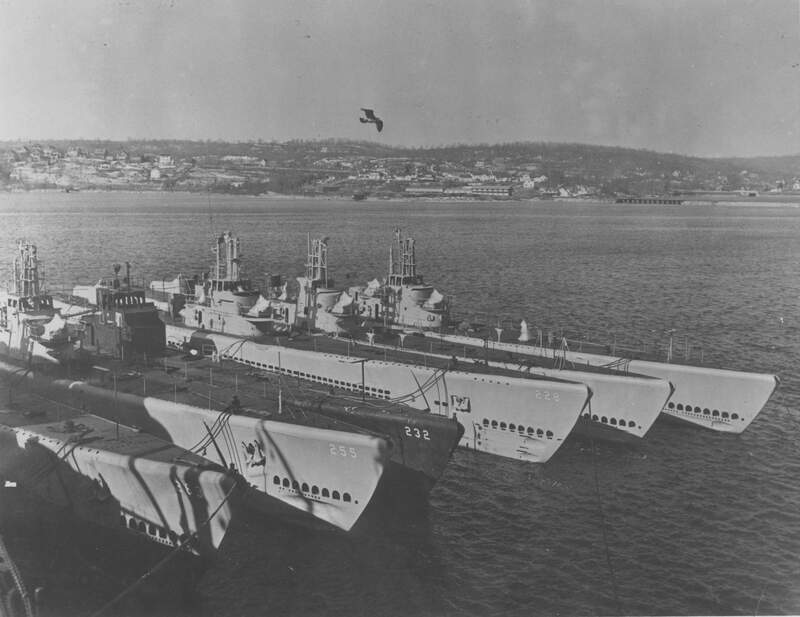 476k Bow view of submarines post WW II at New London, Conn.
From inboard to outboard are six boats, four identified by hull numbers: Drum (SS-228), Halibut (SS-232), Haddo (SS-255) and Paddle (SS-263). Outboard of her are two numberless boats. All the boats are decommissioned: none are flying colors or union jack. 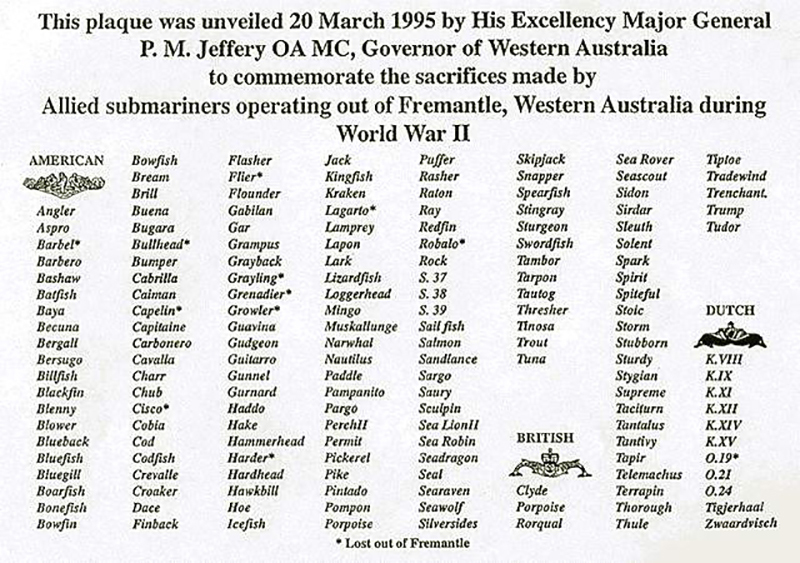 Date is after 16 February 1946 when Drum was decommissioned and before Halibut was sold for scrap on 10 January 1947. Halibut had suffered major damage by the Japanese and was considered beyond economical repair. She is the only one of the group not freshly painted, and has been stripped of deck guns and other gear, probably in preparation for sale. The outboard boat has a small pennant flying from her jack-staff. The boats in commission popped up with numbers right away soon after VJ Day, so the outboard boats may just be getting painted up in Haze Grey in preparation for mothballing, with the numbers to follow. These two boats are older EB-built boats. 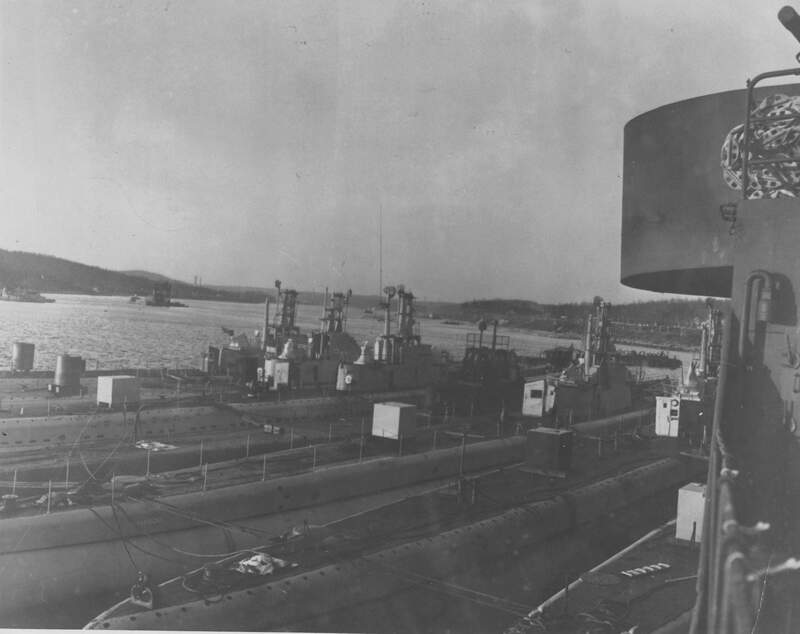 The inboard of the two numberless boats is likely the Gabilan (SS-252). It has a very distinct cut-down of the fairwater. Same bridge cut down low like most other Gato's but the sides of the wagon train were not cut out so it is solid, not open like most other Gato's that were cut down that low. Also location of SJ and SD radar antennas is the same as the latest pic of Gabilan . Also venturi looks the same. 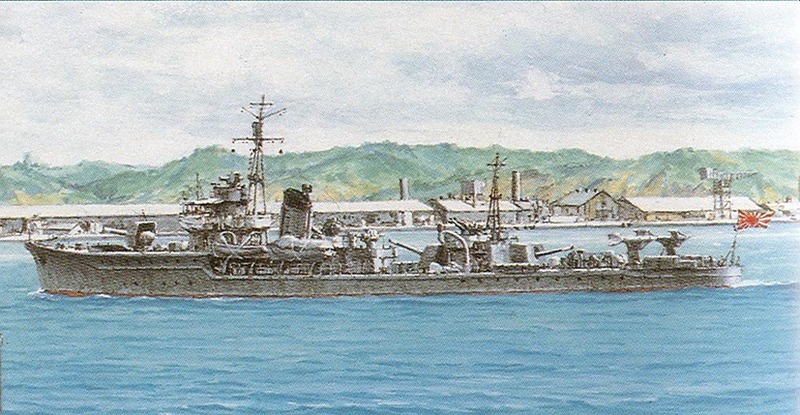 Gabilan was decommissioned in 1946 and laid up at New London which would match the timing and location. USN photo & text courtesy of David Buell. Photo i.d. & text courtesy of John Hart. 380k Stern view of submarines post WW II at New London, Conn.
From inboard to outboard is the reverse of the above. USN photo & text courtesy of David Buell. Photo i.d. & text courtesy of John Hart.